Depending on your individual situation, a Fixed removable implant bridge can be made in just one day for the lower jaw. The main benefit of fixed removable alternative is that it is rigid like a fixed bridge yet removable, so it is much easier to clean. Losing your own teeth can be a big emotional trauma and dentures, especially lower dentures, are no fun. 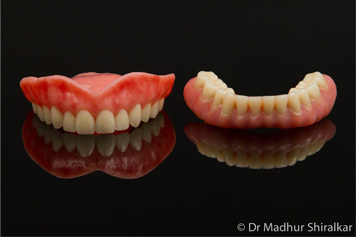 A Syncone implant denture or bridge provides a stable solution for both upper and lower jaw. For upper jaw it doesn’t cover the roof of your mouth and is far less bulky than a denture and feels more natural. Aesthetic & sleek upper syncone bridge on 6 implants. For, Syncone implant denture, Ankylos dental implants are placed strategically in the upper or lower jaw. Specialized titanium posts or abutments are then secured on your dental implants. Specialized gold caps, which are attached to the denture bridge now precisely fit on the implant posts. When this is in place, the full arch implants teeth perform like the patient’s own teeth. The main benefits of full arch implant teeth are more stability and increased bite strength. Call (03) 9417 6355 today for your personal consultation and assessment.